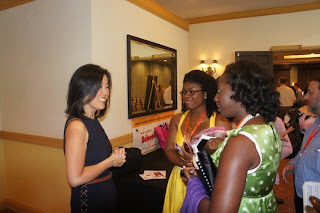 I had heard about Michelle Rhee from the movie Waiting for Superman. I thought it would be interesting to interview her because I am interviewing the Superintendent of my own school district and because some of Ms Rhee's positions are controversial with some people. She is really cool and nice too! PMAKid: What are your three favorite books and why? Michelle Rhee: A Hope in the Unseen by Ron Suskind: He followed Cedric Jennings from his last year in a DC high school to Brown University. In a compelling way it highlighted the urgency for reform in DC and cities like it. Why Boys Fail, by Richard Whitmire: I even wrote the foreword to this one! He points out a lot of the research showing challenges boys face in particular, and I would definitely recommend it to educators, parents, and students. Love You Forever, by Robert Munsch. Read it and you'll see why it's one of my favorites :). PMAKid: What are your three favorite songs and why? Michelle Rhee: I like all kinds of music so I'm not sure I'd list 3 favorite songs, because I'm drawn more to the performance and the singer. When I was chancellor in DC, I was blown away by the singing and instrumental talents of some of our kids. At graduation ceremonies, or performances at Duke Ellington School of the Arts, etc., I liked pretty much anything they sang or performed! PMAKid: I know that you started your career in education. Why did you get into teaching in the first place? Michelle Rhee: In my senior year of high school I volunteered at the school where my high school boyfriend's mother worked, and was struck by how tough it was for students, despite their talents and desire to work and do well. They just weren't getting the same kind of education I was fortunate enough to get at the private school I attended, and it didn't make sense to me. That's where the spark for education really started, though it would still be a few years before I would try teaching through Teach for America in Baltimore. PMAKid: A few years ago, you were the Chancellor (which is like a Superintendent, right?) of the Washington, D.C. schools. Before you had that job, I know that the schools in Washington, D.C. were some of the worst in the country. I know that students started doing better at those schools while you were there. What did you do to help make the scores go up? Michelle Rhee: Yes, a chancellor is like a superintendent, but the school system has a different governance structure than most. For us, the mayor was in charge of the school system, rather than a school board. Yes, in 2007 the DC Public Schools were last in the country on a number of measures, and performance improved over the three years we were there (see dcps.dc.gov for more). As far as what we did, it would be too much to describe it all here, but if I had to narrow it down to a few of the most important things, one thing near the top was building a system of accountability among the adults in the system. When I arrived, some people in the central office had not had a performance discussion with their boss in years! Just imagine if you were working along through school and doing your best, and nobody was ever telling you how you were doing, showing you where or how you could improve or challenging you in different ways to reach your goals. So we instituted new performance evaluations across the board. In schools we also negotiated a new teacher contract with the teachers' union, which allowed us to reward excellent teaching and more easily remove ineffective educators from the system in our goal to ensure every child had an excellent teacher. There was much more--everything from recruiting strong principals to creating programs for older high school students that would help them to get on the right track to graduate. I hope you'll read more as I don't want to write a book here! You could start by reading public testimonies I and my team delivered to the DC Council ( click here). PMAKid: I know that people have criticized you because when you were running the schools in Washington D.C., you were deciding who was a good teacher or not based on students scores. Some people say it is not fair to the teachers to judge them based upon a few days of testing. What are your thoughts on this? Michelle Rhee: We were basing these decisions in part on student progress as measured on test scores (50%), not based on test scores alone. As I see it, the whole purpose of a school system is to give children the skills they need to succeed. Hence of course we have to measure to what extent schools and teachers are giving kids those skills. Standardized tests are definitely not a perfect measure of that, but no evaluation system is perfect (not in teaching or anywhere else). This doesn't mean we're not responsible for results. Regarding the few days of testing, teachers actually used assessments throughout the year to track kids' progress, adjusting course where necessary in their instruction (for example, re-teaching the material in another way if the kids didn't learn it the first time). So the tests don't represent just a few days but the whole year, with time to correct and evaluate along the way. PMAKid: My school is one of the only elementary schools in Sacramento that has its own school band. How important do you think it is that elementary schools have things like music or art or other stuff like that? Michelle Rhee: VERY IMPORTANT!! There is research that shows a correlation between arts education and student achievement on other subject areas, and it's part of growing up that all kids should be able to experience. PMAKid: You recently started a new organization called StudentsFirst. What are you trying to do with StudentsFirst? Michelle Rhee: This is where I'm going to ask you to do some research and digging :). Check out our agenda and mission statement on www.studentsfirst.org. PMAKid: What do you do everyday? Michelle Rhee: It is different every day. Often I am talking to groups of teachers, parents, or government officials working on school reform. I travel a lot, and I meet with my staff about different initiatives we're working on across the country. It's a great job! PMAKid: From what I have read about you, it seems like you and the teacher's unions do not get along very well. I know that last year, one of my teachers that I liked got laid off from her job and now the school has a new teacher to replace her. I think the new teacher is there because they had been teaching longer. I don't know what kind of teacher he is, but it does not seem fair that a good teacher got kicked out just because she had not taught as long. What do you think about this? Michelle Rhee: I agree with you completely that it's not fair (I'd say not fair to kids, most importantly). That happens during lay-offs in many cases due to a policy called Last-in, First-Out (LIFO). We've been talking and writing about this a lot. What I'd love for you to do is to read about it (Google, or StudentsFirst.org), see what you think and see if you want to get involved to eliminate LIFO! PMAKid: I know you have kids. What do you do to teach them to stay away from drugs and alcohol? How do you teach them to keep a Positive Mental Attitude even when times are tough? Michelle Rhee: Great question! We talk pretty openly about most things. I ask their opinions and find out what's happening during their day. They have their challenges just as all kids do, and they've heard me say many times that more important than being naturally smart or good at something is how hard you're willing to work to get to your goals. Kids often learn more by example than words though, so mostly I try to demonstrate what that persistence looks like in my own life. If I overcome challenges positively myself, they learn not to take things too personally but just to find a better way when another way isn't working for them.